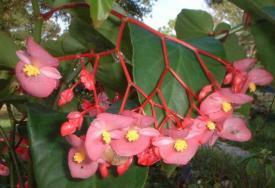 In tropical or subtropical climates, the wax begonia is a perennial plant that can grow to the size of a small shrub. In cooler climates, it is grown as an annual. It has been popular in gardens since the Victorian era, and it is one of the most common plants in commercial cultivation today. A group of hybrid cultivars, Begonia x semperfloren-cultorum, is the most widely planted. This group probably originated from a cross between Begonia cucullata var Hookeri and Begonia schmidtiana. The genus Begonia is unusual because all 1500+ species can be hybridized with one another, even those that originated on different continents. Begonia semperflorens-cultorum was named for its long bloom period, from semperflorens, meaning 'everblooming'. The common name, wax begonia, refers to the waxy sheen of the leaves. The genus was named in honor of Michel Bégon (1638-1710), a French amateur botanist who collected begonias from while he was stationed in Santo Domingo with the French navy. Wax begonias are prized for their constant bloom and the uniformity of size and shape within each variety.These plants grow from six to eighteen inches tall with a spread of six to twelve inches, depending on the variety. The foliage can be green, bronze, or red; some varieties are variegated, and a few have white leaves. The flowers come in shades red, pink, and white, and a few varieties have double flowers. Wax-leaf begonias prefer dappled or bright shade. Most varieties can tolerate heavy shade, and a few varieties have been developed to do well in full sun. Their tolerance for shade makes them suitable for use as houseplants as well as in the garden. They are not fussy about soil pH, but they do need good drainage. The soil should be kept evenly moist for the best flower production, but the plants will tolerate dryness once they are established. Wax begonias are heavy feeders. Regular fertilizing will encourage all-summer bloom. Frequent pinching results in fuller plants and heavier bloom. These begonias are at their best when daytime temperatures are between 60 and 70 degrees Fahrenheit. They will tolerate cooler and warmer temperatures, but they cannot tolerate frost. Set plants out in spring after the last frost date. Wax begonias can be grown from seed, but are most easily increased by cuttings. This is a great plant for gardeners on a budget, because the cuttings root so easily! You can start plants on a sunny windowsill in the fall and winter. Wax begonias are wonderful bedding plants! The uniformity of their size and shape makes them perfect for mass plantings. They are especially good in shady areas where few other plants will bloom. 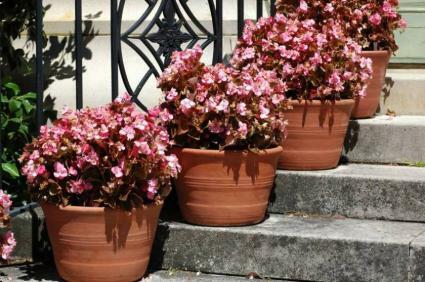 Wax begonias are often grown as container plants. They make good houseplants as well. Wax begonias are relatively untroubled by pests and diseases. They are sometimes attacked by whiteflies, and in humid conditions they may get powdery mildew or other fungus diseases.